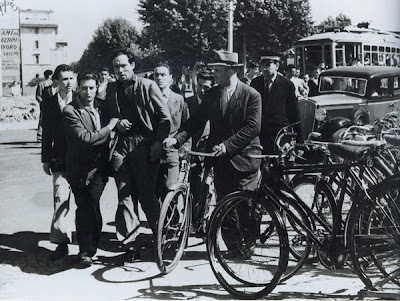 Vittoria De Sica’s The Bicycle Thief is a truly great classic of post-war Italian neorealism. It’s a little like Gogol’s The Overcoat—a story of the loss of a seemingly mundane item that has great significance to an impoverished worker, who invests the object with almost magical significance. De Sica’s protagonist voyages in despair through Rome with his son, vainly trying to recover a lost bicycle. In a latter-day version of De Sica’s tale, a guest recently checked into the Las Vegas MGM Grand, only to arrive at his room bereft of a valued duffle bag. Anyone who has ever visited the MGM Grand will realize that any comparison with post-war Rome is nil. Bombed-out buildings and ancient ruins are replaced by an air of gaudy opulence and faux antiquity. Still, a lost bag is a lost bag, and when you have been deprived of something, you desire it even more, even if the contents—a couple of shirts, some underwear and socks—are relatively modest. But lo, myths are constantly being made. Every River Acheron provides its Charon, every Inferno its Virgil. In this case the MGM sent a messenger named Deepak from hospitality, who exuded a Buddha-like compassion, leading the traveler from the gruff, unhelpful lost-and-found attendant, who acted and looked like a dangerous barking dog, to the inner sanctum of hotel security, manned by one Officer Dobbs. Dobbs, a genial fellow with an earplug, knew his way around the maelstrom. The check-in time of the traveler was ascertained, recordings made by hotel video cameras were studied, and it was determined that the bag had never come into the MGM in the first place. Rather, it had been left in a cab whose number was easily identified. By three o’clock the next morning the bag was returned.